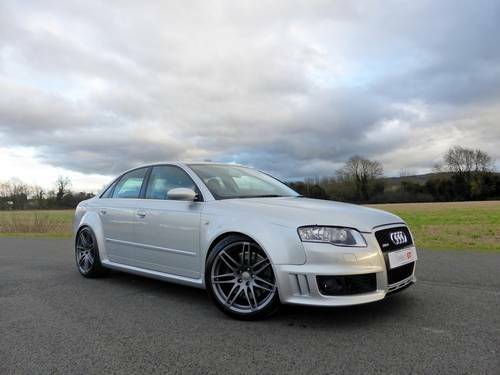 A superb 2006 Audi RS4 Quattro Saloon presented in Avus Silver Metallic with Valcona Black Leather Bucket Seats and Carbon Fibre Trim. 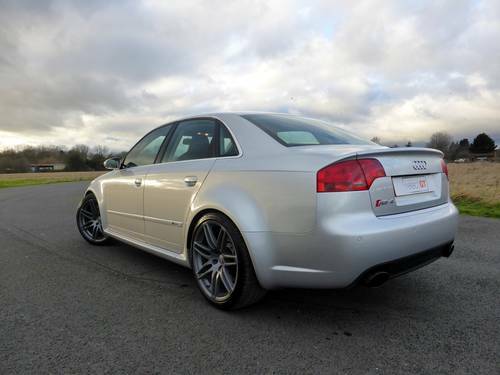 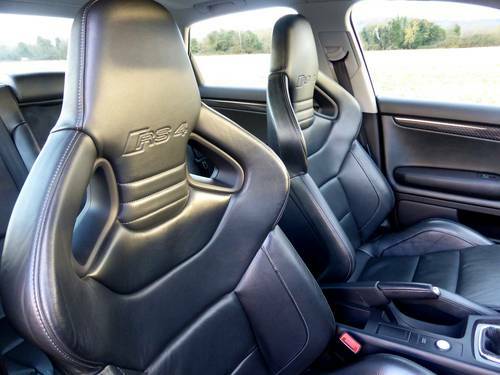 If you are familiar with this incarnation of the RS4 then you will be fully aware of the fantastic 4.2 V8 FSI engine which produces 420 bhp, powering all 4 wheels via its Quattro permanent 4 wheel drive system and a 6 speed manual transmission. 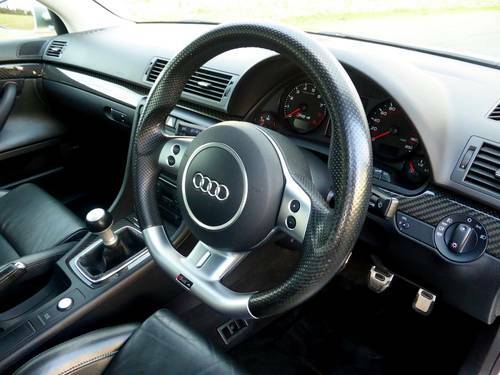 This example is well equipped with the more desirable Heated Leather Bucket Seats and the Flat Bottom Steering Wheel. 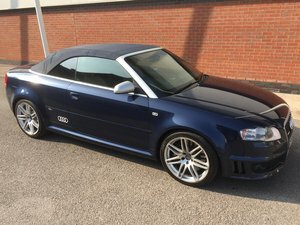 Other features include Audi Concert CD, BOSE Audio, Bluetooth, Front and Rear Parking Sensors, Xenon Plus Headlights with Daytme Running Lights, Freshly Refurbished 19” Alloy Wheels in Matt Grey, Sports Mode, Push Button Start, Electric Sunroof, Electronic Climate Control, Cruise Control, Heated Seats, Front Centre Armrest, Drivers information System, Aluminium Pedal Set, Front Fog Lights, ISOFIX, Electric Windows and Electric Mirrors. 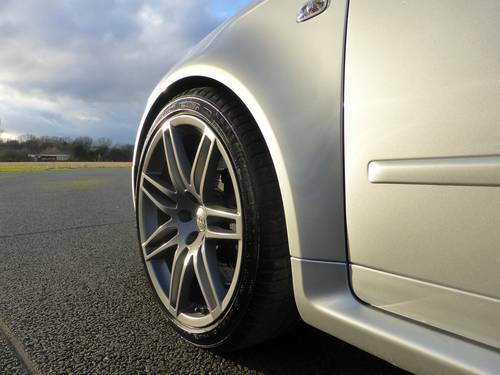 It is well documented that the Achilles Heel of the B7 RS4 is its standard DRC suspension set up, this vehicle has been upgraded with the renowned Bilstein Coilover set up. 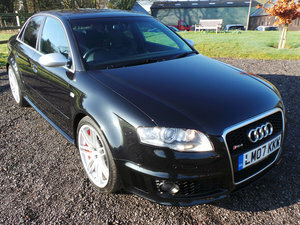 Furthermore this particular car benefits from a Miltek exhaust system, a stage 2 inlet manifold and an APR remap. 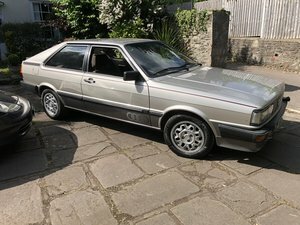 Over the course of its 107,000 miles, this car has being serviced 15 times with a good amount of documentation and a stamped service book to back this up. 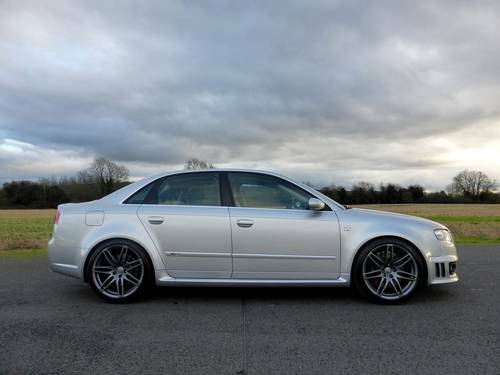 Additional work includes replacement of the oil cooler lines and an inlet valve carbon clean which are common issues on the RS4. 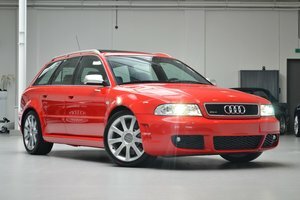 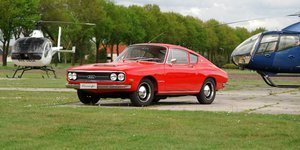 Supplied with the original Audi folder, all manuals, a clear HPI report and a long MOT. 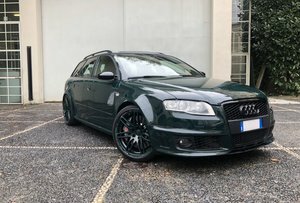 I have personally sold many B7 RS4’s in my time and this example drives exceptionally well and feels as tight as a car with half the miles. 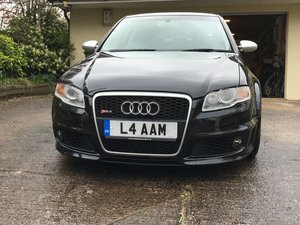 The accompanying soundtrack is addictive and at this money it is hard to think of a car that can offer as much as this RS4 can.